Text: Twenty years ago amusement for the people was at low-water mark. Railways were less numerous and extensive, and railway directors had not yet thought of working the profitable field suggested by the little word ‘excursion.’ ‘Eight hours by the seaside,’ to be compassed comfortably within a holiday of a single summer’s day was a miracle scarcely even dreamt of by the most sanguine progressionist. Thousands and tens of thousands of London-born men and women lived and laboured through a long life-time, and never saw the sea at all. Sheerness, twenty years ago, was the working man’s seaside; and his knowledge of sea sand was confined to as much of it as was unpleasantly discovered lurking within the shells of the plate of winkles served up at his shilling tea at Gravesend. Even the green country ‘far removed from noise and smoke,’ was, if not a sealed book to him, at least a volume placed on so high a shelf that, after some experience, he was driven to the conclusion that the pains and penalties attending a climb for it were scarcely compensated by success and temporary possession of the prize. The only conveyance at his service—and that only on recognized holiday occasions—was the greengrocer’s van, newly painted and decorated for the event, and in which a mixed company of the sexes crowded, and were dragged along the hot and dusty road at the rate of five miles an hour, towards Hampton Court or Epping Forest, there to huddle on the grass, and partake of a collation that, but for its four hours’ grilling on the van roof under a blazing sun, would have been cold, with flask liquor or luke-warm beer out of a stone jar as liquid accompaniments. Twenty years ago a Crystal Palace had existence nowhere but within the cover of that book of wonders, the ‘Arabian Nights’ Entertainments,’ and the soil out of which the museum at South Kensington has sprung was devoted to the growth of cabbages. In that dark age, however, it is questionable if the inconveniences enumerated were regarded as such. The people knew no better. The Jack of the past generation was a Jack-of-all-work, according to the strictest interpretation of that term. So seldom did he indulge in a holiday that he went at it as a teetotaller broke loose goes at hard drinking, and it unsettled him for a week afterwards. His play-time imposed on him more real hard labour than his accustomed jog-trot worktime, and he was an unhappy, despondent man until his excited nerves grew calm, and the tingling of his blood subsided. Such were the alarming effects on him that it seemed a happy dispensation that Whitsun and Easter came each but once a year. As a man who earned his bread by the sweat of his brow, and who consequently was in a violent condition of perspiration during twelve hours in each twenty-four, it is scarcely likely that the question of evening amusement would much trouble the working man of that period. Jaded and weary, he was by necessity a hearth and homeloving man. He had neither the pluck nor the inclination to be anything else. The evening saw him plodding homeward, and all his desire was to remove his heavy boots from his tired feet, and engage with all speed in the demolition of his tea-supper, after which there was nothing for it but for him to drag his chair to the chimney-corner, and there sit and smoke or doze till bedtime. If he were inclined for an hour or so of away-from-home recreation, where could he find it? There were the theatres; but he so rarely went to such places that ‘going to the play’ was an event not to be treated in an off-hand manner, or to be decided on without due deliberation. Besides, it was a dear treat. Supposing that he went into the pit (he would take the ‘missus’ of course), there would go two shillings, and at least another one for a drop of something to take in and a mouthful of something to eat, and three shillings is a large sum. Being a Briton and a loyal man, and as such recognizing ‘the social glass and the cheerful song’ as chief among the supporting pillars of the Constitution, he would very willingly have contributed his share towards it; but where, as a sober and proper person, was his opportunity? Truly, he might drink long life and prosperity to the Queen, and confusion to her enemies, as he sat at home over the pint of beer fetched from the public-house; but amidst the distracting influences of domesticity how much of heartiness would there be in the patriotic sentiment? He might, as he sat with his feet on the home fender-bar, raise his voice harmonically in praise of his wife and ‘the troop of little children at his knee,’ or of ‘Tom Bowling,’ or ‘Old John Barleycorn;’ but he would grow weary in less than a week of such pastime, under repeated reminders that the baby was asleep, or that his fellow-lodgers were complaining. Even twenty years ago there were ‘concert rooms’ where ‘professional talent’ was engaged, and where sixpence was charged for admission; but, as a rule, these were dirty, low, disreputable dens, where liquor little better than poison was sold, and where the company consisted chiefly of the riff-raff of the town, both male and female. He had neither the means nor the inclination to resort to a place of this description. All, then, that was left to him was the tavern parlour ‘sing-song,’ or free-and-easy, usually celebrated on Mondays and Saturdays, these being the times when he was most likely to have a shilling in his pocket. But what amount of satisfaction was to be got out of it? Excepting for the inordinate quantity of malt or spirituous liquors the working man felt bound to imbibe for the good of the house, the ‘free-and-easy’ was as tame as tame could be. The same individual—the landlord—occupied the chair invariably; the same men sang the same songs (it would have been regarded as a most unwarrantable liberty if Jones had attempted to render a ditty known as Wilkins’s); the same jokes were exchanged; the same toasts and sentiments found utterance. It was not enjoyment at all that occupied the company, but a good-natured spirit of forbearance and toleration. Scarcely a man in the room came to hear singing, but to be heard singing. This was the weakness that drew the members of the ‘ free-and-easy’ together, and every man, out of tender consideration for his own affliction, was disposed to treat an exhibition of the prevalent malady on the part of a neighbour with kindly sympathy. But the morning’s reflection ensuing on such an evening’s amusement never failed to disclose the dismal fact that there was ‘nothing in it’—nothing, that is, but headache and remorse for money wasted. Of late years, however, the state of the British handicraftsman has undergone an extraordinary change. He is not the same fellow he used to be. He has cast aside the ancient mantle of unquestioning drudgery that so long hung about his drooping shoulders. He has straightened his neck to look about him, a process which has elevated his view of matters generally at least three inches (and that is a good deal in the case of a man whose nose from boyhood has been kept at the grindstone, and whose vision has been always at a bare level with the top of that useful machine). It was no more than natural that’ work’ being the theme that had so long occupied his attention, he should, having satisfactorily settled that matter, turn to its direct antithesis, ‘play,’ and make a few inquiries as to what amendment were possible in that direction. It became evident to him that this portion of the social machine, no less than the other, was out of order. It appeared all right from a superficial view; but when you came closely to examine it there were loose screws in every direction, and many of the main wheels were so clogged with objectionable matter, that no decent man could safely approach it. This was serious. The reformed handicraftsman had leisure now, and considerably more money than in the old time. Offer him a fair evening’s amusement, and he would pay his shilling for it cheerfully But, mind you, it must be fit and proper amusement, and such as chimed harmoniously with his newly-developed convictions of his respectability and intellectual importance. But, looking to the right and to the left of him, he failed to discover what ho sought; and probably he would to this very day have been vainly inquiring which way he should turn, had it not been for certain enterprising and philanthropic persons, who, ascertaining his need, generously undertook the task of providing for it. The arguments used by the disinterested gentlemen in question showed beyond a doubt that they thoroughly understood the matter. ‘What you want,’ said they to the working man, ‘is something very different from that which now exists. You like good music, you have an affectionate regard for the drama; but if at the present time you would taste of one or the other you are compelled to do so under restrictions that are irksome. The theatre is open to you, but you cannot do as you like in a theatre. You must conform to certain rules and regulations, and, in a manner of speaking, are made to “toe the mark.” If you want a glass of beer—and what is more natural than that you should?—you can’t get it. What you can get for your sixpence is half a pint and a gill of flat or sour stuff in a black bottle, and to obtain even this luxury you must creep noiselessly to the shabby little refreshment-room and drink it there and creep back again to your seat in the pit as though you had been guilty of something you should be ashamed of. You would like a pipe or a cigar; you are used to smoking of evenings, and deprivation from the harmless indulgence disagrees with you. No matter; you must not smoke within the walls of a theatre; if you attempted it the constable would seize you and never loose his hold on your collar till he had landed you on the outer pavement. This, in substance, was the prospectus of the first music hall established in London, and the public expressed its approval. How the fair promises of the original promoters of the scheme were redeemed we will not discuss. Undertakings of such magnitude are sure to work uneasily at the first. It will be fairer to regard the tree of twenty years’ growth with its twenty noble branches flourishing in full foliage and melodious with the songs of the many songsters that harbour there. We cannot listen to them all at once, however sweet though the music be. Let us devote an hour to one of the said branches. Which one does not in the least matter, since no one set of songsters are confined to a branch. They fly about from one to another, and may sometimes be heard—especially the fanny ones—on as many as four different boughs in the course of a single evening. Simply because it is the nearest let us take the Oxbridge, one of the most famous music halls in London, and nightly crowded. Either we are in luck or else the talent attached to the Oxbridge is something prodigious. Almost every vocal celebrity whose name has blazoned on the advertising hoardings during the season is here tonight—the Immense Vamp, the Prodigious Fodgers, the Stupendous Smuttyman, the Tremendous Titmouse, together with ‘Funny’ Freddys, and ‘Jolly’ Joeys, and ‘Side-splitting’ Sammys by the half-dozen. Some of these leviathans of song were authors of what they sang, as, for instance, the Prodigious Podgers, who had recently made such a great sensation with his ‘Lively Cats’-meat Man.’ As I entered the splendid portals of the Oxbridge the natty ‘turn-out’ of Podgers, consisting of three piebald ponies in silver harness and a phaeton that must have cost a hundred and fifty guineas at least, was there in waiting, ready to whirl the popular Podgers to the Axminster as soon as the Oxbridge could possibly spare him. The Oxbridge, as usual, was crowded, the body of the hall, the sixpenny part, by working men and their wives, with a sprinkling of ‘jolly dogs’ and budding beardless puppies of the same breed, whose pride and delight it is to emulate their elders. As regards the audience this is the worst that may be said of the body of the hall. It was plain at a glance to perceive that the bulk of the people there were mostly people not accustomed to music halls, and only induced to pay them a visit on account of the highly-respectable character the music halls are in the habit of giving themselves in their placards and in the newspapers. In the stalls and the more expensive parts of the house, and before the extensive drinking bar, matters were very different. Here were congregated selections from almost every species of vice, both male and female, rampant in London. Here was the Brummagem ‘swell’ with his Houndsditch jewellery and his Whitechapel gentility, and the well-dressed blackguard with a pound to spend, and the poor, weak-minded wretch of the ‘Champagne Charlie’ school, and the professional prowler hovering about him with the full intent of plucking him if he finds the chance. As for the females of this delightful clique, it is sufficient to say that they plied their trade without the least attempt at concealment. And why should they not? who is to check them? Not the proprietor of the Oxbridge. It is a fact that he admits them without charge, seeing his interest therein. What else should take Champagne Charlie to the Oxbridge, and the host of ‘swells’ who order neat little suppers and recklessly fling down their sovereigns to pay for wine that in sufficient quantity would sicken a hog? Of what use is ‘the body of the hall’ to the proprietor? How far do paltry sixpences go towards paying Podgers his three guineas a night? What profit is there on the price charged Bill Stubbs for his pint of stout? Not but that the frequenters of the sixpenny part are very useful; indeed, to speak truth, the Oxbridge could not get on well without them. They keep up appearances, and present a substantial contradiction to the accusation that the music hall is nothing better than a haunt for drunkenness and debauchery. But inasmuch as the effusions of Podgers are as a rule unintelligible except to the possessors of a slang dictionary, he is less obnoxious than others of his brethren. What these productions are need be no more than hinted to ears polite. The mischief is that the ten thousand ears unpolite are opened for the reception of the poison night after night in twenty music halls in and about London, and no one says nay. The male singer of the music hall, however, whether he takes the shape of the impudent clown who pretends to comicality, or of the spoony sentimentalist who tenderly gushes forth such modern enchanting melodies as ‘Maggie May’ or ‘Meet me in the Lane,’ is not the most pernicious ingredient that composes in its entirety the music hall hero. Time was, when with a liberal steeping of Vamps, and Podgers, and Smuttymans, the decoction proved strong enough, but, like indulgence in other poisons, what is a sufficient dose this year is useless as water next. It was found necessary to strengthen the mixture—to make it hotter of that kind of spice most grateful to the palate of the vulgar snob with a pound to spend. To effect this, there was nothing for it but to introduce the comic female element, or, as she more modestly styles herself, the’ serio-comic.’ The ‘serio,’ however, is not obtrusive. You seek for it in vain in the brazen pretty face, in the dress that is exactly as much too high as it is too low, in the singer’s gestures, looks, and bold advances. Decent men who, misled by placards and newspaper advertisements, take their wives and daughters to the Oxbridge or the Axminster, may, as they listen, tingle in shame at the blunder they have committed; but the dashing, piquant, saucy delineator of ‘What Jolly Gals are we’ has the ears and the yelling admiration of the brainless snobs and puppies before alluded to, and the mad noises they make, demanding a repetition of the detestable ditty, quite drown the feeble hisses of remonstrance the decent portion of the auditory may venture to utter. Some time since, during the theatre and music hall controversy, a worthy London magistrate announced from his judicial bench that on the evening previous he had visited one of the most popular of the halls, and found everything creditable, and discreet, and decorous: a pretty penny it must afterwards have cost somebody for champagne, to pacify the patron snobs and puppies for depriving them of their evening’s amusement. But—and it is alarming to remark it—even the indecent, impudent ‘serio-comic’ female, who, going the full length of the tether allowed her, might have been supposed equal to all demands, is palling on the palate of the Oxbridge habitué. He must have something even more exhilarating; and, ever ready to oblige, the music hall proprietor rigs up a trapeze, and bribes some brazen, shameless woman to attire in man’s clothes, and go through the ordinary performances of a male acrobat. Rivalling the new idea, a South London music hall proprietor is advertising the ‘Sensational Can-can, exactly as in France.’ What is the next novelty in preparation? Comments: James Greenwood (1832-1929) was a British novelist and campaigning journalist, known for his investigations into the lives of London’s poor, sometimes using disguise. 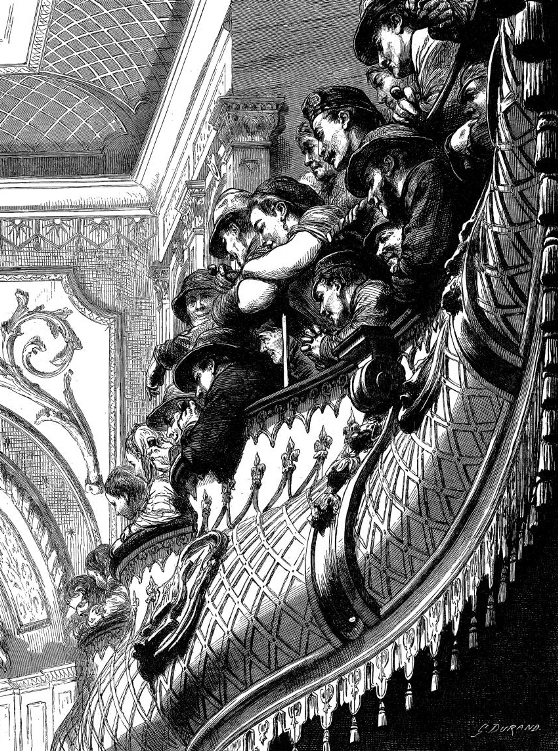 There was no ‘Oxbridge’ (or ‘Axminster’) music hall – the hall described here may have been inspired by the Oxford Music Hall in London’s Oxford Street, but at the time of this article the Oxford was not in operation, having burned down in March 1868 and not re-opening until August 1869. The artists named are likewise semi-fictions. 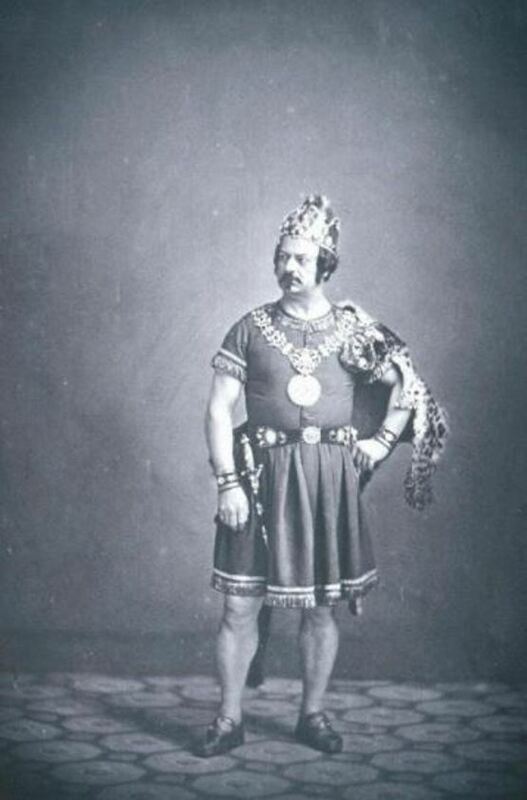 The Immense Vamp would appear to be Alfred Vance, the Great Vance, ‘lion comique‘ star of the Oxford in the 1860s, whose signature song was ‘I’m a Chickaleary Bloke’, though it is attributed here to ‘Popular Podgers’. Vance’s great rival of the period was George Leybourne, whose signature tune was ‘Champagne Charlie’. Text: Reached Philadelphia before night & stopped at Girard House. At night went to Walnut Street Theatre to hear Forrest, who was doing Rolla in the play of Pizzarro and did it shockingly – Miserable actor. Mrs Drew, in Elvira, played well, and was the only one who did. Miss Weston in Cora did passably – The rest were all exceedingly common place – Did not stay for the after piece. Comments: Orville Hickman Browning (1806-1881) was an American lawyer and Whig Republican senator. His diaries contain several references to theatregoing. Edwin Forrest was one of the great tragedians of the nineteenth-century American stage. Louisa Lane Drew (often billed as Mrs John Drew) was an ancestor of the great Barrymore acting family. The film actress Drew Barrymore is her great-great-granddaughter. Both appeared in Richard Brinsley Sheridan‘s tragedy on the conquest of Peru, Pizarro, at the Walnut Street Theatre in Philadelphia, the part of Rolla being one of Forrest’s most celebrated roles. Text: As we were returning to our lodgings, we saw in Exeter Street, Strand, one of those exhibitions that can be seen in almost any of the streets in the suburbs of the Metropolis, but which is something of a novelty to those from the other side of the Atlantic. This was an exhibition of “Punch and Judy.” Everything was in full operation when we reached the spot. A puppet appeared eight or ten inches from the waist upwards, with an enormous face, huge nose, mouth widely grinning, projecting chin, cheeks covered with grog blossoms, a large protuberance on his back, another on his chest; yet with these deformities he appeared uncommonly happy. This was Mr. Punch. He held in his right hand a tremendous bludgeon, with which he amused himself by rapping on the head every one who came within his reach. This exhibition seems very absurd, yet not less than one hundred were present—children, boys, old men, and even gentlemen and ladies, were standing by, and occasionally greeting the performer with the smile of approbation. Mr. Punch, however, was not to have it all his own way, for another and better sort of Punch-like exhibition appeared a few yards off, that took away Mr. Punch’s audience, to the great dissatisfaction of that gentleman. This was an exhibition called the Fantoccini, and far superior to any of the street performances which I have yet seen. The curtain rose and displayed a beautiful theatre in miniature, and most gorgeously painted. The organ which accompanied it struck up a hornpipe, and a sailor, dressed in his blue jacket, made his appearance and commenced keeping time with the utmost correctness. This figure was not so long as Mr. Punch, but much better looking. At the close of the hornpipe the little sailor made a bow, and tripped off, apparently conscious of having deserved the undivided applause of the bystanders. The curtain dropped; but in two or three minutes it was again up, and a rope was discovered, extended on two cross pieces, for dancing upon. The tune was changed to an air, in which the time was marked, a graceful figure appeared, jumped upon the rope with its balance pole, and displayed all the manoeuvres of an expert performer on the tight rope. Many who would turn away in disgust from Mr. Punch, will stand for hours and look at the performances of the Fantoccini. If people, like the Vicar of Wakefield, will sometimes “allow themselves to be happy,” they can hardly fail to have a hearty laugh at the drolleries of the Fantoccini. There may be degrees of absurdity in the manner of wasting our time, but there is an evident affectation in decrying these humble and innocent exhibitions, by those who will sit till two or three in the morning to witness a pantomime at a theatre-royal. Comments: William Wells Brown (c.1844-1884) was an African-American abolitionist lecturer, historian, playwright and novelist. He spent 1849 to 1854 living in Britain. Fantoccini are marionettes, puppets controlled by wires or string, associated with Italy. The “gaff” throws out no plausible puffs, no mendacious placards, respecting the entertainment to be found therein. The public take the genuineness of the “gaff” for granted, and enter by dozens. The “gaff” has been a shop—a simple shop—with a back parlour to it, and has been converted into a hall of delight, by the very simple process of knocking out the shop front, and knocking down the partition between the shop and parlour. The gas-fittings yet remain, and even the original counters, which are converted into “reserved seats,” on which, for the outlay of twopence, as many costers, thieves, Jew-boys, and young ladies, as can fight for a place, are sitting, standing, or lounging. For the common herd—the οἱ πολλοί—the conditio vivendi is simply the payment of one penny, for which they get standing rooms in what are somewhat vaguely termed the “stalls,”—plainly speaking, the body of the shop. The proscenium is marked by two gas “battens” or pipes, perforated with holes for burners, traversing the room horizontally, above and below. There are some monstrous engravings, in vile frames, suspended from the walls, some vilely coloured plaster casts, and a stuffed monstrosity or two in glass cases. The place is abominably dirty, and the odour of the company generally, and of the shag tobacco they are smoking, is powerful. A capital house though, to-night: a bumper, indeed. Such a bumper, in fact, that they have been obliged to place benches on the stage (two planks on tressels), on which some of the candidates for the reserved seats are accommodated. As I enter, a gentleman in a fustian suit deliberately walks across the stage and lights his pipe at the footlights; while a neighbour of mine, of the Jewish persuasion, who smells fearfully of fried fish, dexterously throws a cotton handkerchief, containing some savoury condiment from the stalls to the reserved seats, where it is caught by a lady whom he addresses by the title of “Bermondsey Bet.” Bet is, perhaps, a stranger in these parts, and my Hebrew friend wishes to show her that Whitechapel can assert its character for hospitality. Comments: George Augustus Henry Sala (1828-1895) was a British journalist, among the most celebrated of his day, though at the time of his article on life in London’s East End, from which the above extract is taken, he had just started out in the profession, writing for Charles Dickens‘s journal Household Words. ‘Penny gaff’ was term describing the cheap Victorian theatre which flourished in London’s East End between 1830 and 1900. These were generally located in vacant shops or warehouses, and could house anything from a few dozen to an audience of 400 or more. Their programmes were a mixture of melodrama, cut-down Shakespeare, variety acts, dances and songs. The Effingham saloon, established in 1834, was adapted into a theatre in 1858, the New Garrick. It was followed on the same site by the Yiddish theatre venue New East London Theatre (burned down 1879), which was in turn followed by the renowned boxing venue Wonderland (burned down 1917). In 1921 it became the Rivoli Cinema. Text: On looking over the columns of The Times, one morning, I saw it announced under the head of “Amusements,” that “Ira Aldridge, the African Roscius,” was to appear in the character of Othello, in Shakspeare’s celebrated tragedy of that name, and, having long wished to see my sable countryman, I resolved at once to attend. Though the doors had been open but a short time when I reached the Royal Haymarket, the theatre where the performance was to take place, the house was well filled, and among the audience I recognized the faces of several distinguished persons of the nobility, the most noted of whom was Sir Edward Bulwer Lytton, the renowned novelist — his figure neat, trim, hair done up in the latest fashion — looking as if he had just come out of a band-box. He is a great lover of the drama, and has a private theatre at one of his country seats, to which he often invites his friends, and presses them into the different characters. As the time approached for the curtain to rise, it was evident that the house was to be “jammed.” Stuart, the best Iago since the days of Young, in company with Roderigo, came upon the stage as soon as the green curtain went up. Iago looked the villain, and acted it to the highest conception of the character. The scene is changed, all eyes are turned to the right door, and thunders of applause greet the appearance of Othello. Mr. Aldridge is of the middle size, and appeared to be about three quarters African; has a pleasant countenance, frame well knit, and seemed to me the best Othello that I had ever seen. As Iago began to work upon his feelings, the Moor’s eyes flashed fire, and, further on in the play, he looked the very demon of despair. When he seized the deceiver by the throat, and exclaimed, “Villain! be sure thou prove my love false: be sure of it — give me the ocular proof — or, by the worth of my eternal soul, thou hadst better have been born a dog, Iago, than answer my waked wrath,” the audience, with one impulse, rose to their feet amid the wildest enthusiasm. At the end of the third act, Othello was called before the curtain, and received the applause of the delighted multitude. I watched the countenance and every motion of Bulwer Lytton with almost as much interest as I did that of the Moor of Venice, and saw that none appeared to be better pleased than he. The following evening I went to witness his Hamlet, and was surprised to find him as perfect in that as he had been in Othello; for I had been led to believe that the latter was his greatest character. The whole court of Denmark was before us; but till the words, “‘Tis not alone my inky cloak, good mother,” fell from the lips of Mr. Aldridge, was the general ear charmed, or the general tongue arrested. The voice was so low, and sad, and sweet, the modulation so tender, the dignity so natural, the grace so consummate, that all yielded themselves silently to the delicious enchantment. When Horatio told him that he had come to see his father’s funeral, the deep melancholy that took possession of his face showed the great dramatic power of Mr. Aldridge. “I pray thee do not mock me, fellow-student,” seemed to come from his inmost soul. The animation with which his countenance was lighted up, during Horatio’s recital of the visits that the ghost had paid him and his companions, was beyond description. “Angels and ministers of grace defend us,” as the ghost appeared in the fourth scene, sent a thrill through the whole assembly. His rendering of the “Soliloquy on Death,” which Edmund Kean, Charles Kemble, and William C. Macready have reaped such unfading laurels from, was one of his best efforts. He read it infinitely better than Charles Kean, whom I had heard at the “Princess,” but a few nights previous. The vigorous starts of thought, which in the midst of his personal sorrows rise with such beautiful and striking suddenness from the ever-wakeful mind of the humanitarian philosopher, are delivered with that varying emphasis that characterizes the truthful delineator, when he exclaims, “Frailty, thy name is woman!” In the second scene of the second act, when revealing to Guildenstern the melancholy which preys upon his mind, the beautiful and powerful words in which Hamlet explains his feelings are made very effective in Mr. Aldridge’s rendering: “This most excellent canopy, the air, the brave o’erhanging firmament, this majestical roof fretted with golden fire …. What a piece of work is a man! How noble in reason! how infinite in faculties! in form and moving how express and admirable! in action how like an angel! in apprehension how like a God!” In the last scene of the second act, when Hamlet’s imagination, influenced by the interview with the actors, suggests to his rich mind so many eloquent reflections, Mr. Aldridge enters fully into the spirit of the scene, warms up, and when he exclaims, “He would drown the stage with tears, and cleave the general ear with horrid speech, — make mad the guilty, and appall the free,” he is very effective; and when this warmth mounts into a paroxysm of rage, and he calls the King “Bloody, bawdy villain! Remorseless, treacherous, lecherous, kindless villain!” he sweeps the audience with him, and brings down deserved applause. The fervent soul and restless imagination, which are ever stirring at the bottom of the fountain, and sending bright bubbles to the top, find a glowing reflection on the animated surface of Mr. Aldridge’s colored face. I thought Hamlet one of his best characters, though I saw him afterwards in several others. Comments: William Wells Brown (c.1844-1884) was an African-American abolitionist lecturer, historian, playwright and novelist. He spent 1849 to 1854 living in Britain. 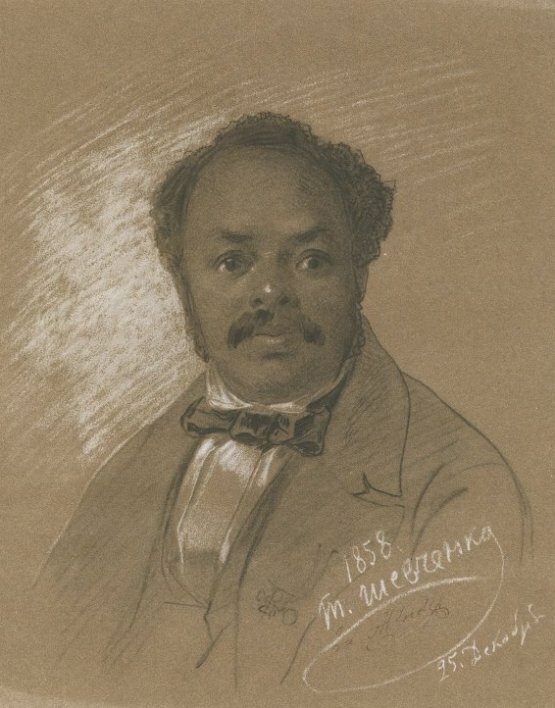 However, there are problems with his account of seeing the great African-American actor Ira Aldridge (1807-1867). Although Aldridge performed in Britain around that time, most of his performances were in provincial theatres, and he did not play Othello at the Haymarket until 1865, two years after Brown’s account was published. The performance may have been an Othello at the Lyceum in 1858, when his reputation was greater and Stuart played Iago, but Brown does not appear to have been in Britain at that date. Nor did Aldridge play Hamlet at this time. Text: A while ago my brother took some of us to Christy’s Minstrels. They are white men, blacked up to look just like negroes. As the last man went off the stage, he stumbled and fell flat, and then he said, “Sambo, why am I like one of Walter Scott’s pomes? Give it up? Because I’m de lay ob de last minstrel!” And everybody laughed, and one of them said, “Pompy, my wife had an awful cold, and de doctor told her to put a plaster on her chest; but she didn’t have no chest, so she put it on her band-box and it drew her bonnet all out of shape.” And then we all clapped and laughed. They are awfully funny. They act on Broadway, down near Grand Street. Comments: Catherine Elizabeth Havens (1839-?) spent her childhood in New York and began writing a diary when she was ten. This passage comes from a long diary entry for 6 August 1850 (her eleventh birthday). Her family lived in Brooklyn, on Ninth Street. Christy’s Minstrels were a troupe of blackface performers (i.e. white performers blacked up), formed in 1843 by Edwin Pearce Christy. At this time the troupe regularly performed at the Mechanics’ Hall at 472 Broadway, New York. Text: Respecting the mise en scène — and I must say even to exaggeration — one may obtain an idea in London by the grand and fantastic splendour with which Shakespeare’s plays were placed on the stage by Charles Kean. Kean, the son of the celebrated actor, but not comparable to his father in genius, had the genuine merit to have applied real talent and profound historical studies in order to produce the plays of Shakespeare in such a style as was never before witnessed, and would never have been conceived by the poet himself. He also adhered to the original with a pious ﬁdelity heretofore unknown. In former times, managers had no scruples about omitting the Fool in ‘King Lear,’ one of the most important ﬁgures in the chief tragic group. Dickens told me that Macready had been the ﬁrst to restore this essential character. At the time of my visit people were thronging to see the ﬁrst representation of the ‘Tempest,’ which had been placed on the stage after innumerable rehearsals, and at an immense outlay. The theatre was crowded. The theatre is not large, and it is quite wonderful what human will and genius have been enabled to accomplish. Painter and machinist had perfectly caught the spirit of the piece: the mise en scène seemed inspired by the fancy of Shakespeare himself. During the overture, the music of which expresses the storm with an accompaniment of roaring thunder, shrieks and cries were heard from within. The whole prelude was thus given before the raising of the curtain. When this took place heavy billows came rolling against the footlights. The whole stage was a tumultuous sea: a large vessel was tossed to and fro — it occupied the larger part of the scene; sailors and passengers ran confusedly about; cries of agony and anguish resounded; the masts fell, and soon the vessel itself disappeared in the foaming brine. Dickens told me, that the ship was made of inﬂated air-tight canvas, the air being let out of which the entire huge body collapses at once, and is hidden by the waves, which were half the height of the scene. The ﬁrst appearance of Ariel was poetically beautiful to a high degree: as Prospero summoned him a shooting star fell from heaven; it touched the grass, it shone in blue and green ﬂames, and rose suddenly before us as Ariel’s beautiful and angel-like form; he stood there in white garments, with wings from his shoulders down to the ground; it was as if he and the starry meteor had ﬂoated through heaven at the same moment. Every appearance of Ariel was different, and all were beautiful: now he appeared clinging by his hand to the tendrils of a vine, now ﬂoating across the scene by some mechanism not easy to be discovered. No cord or rod was visible, yet something of this nature upbore him in his attitude of ﬂight. In one act we saw a bleak winter landscape, changing gradually at the outbreak of sunbeams to an aspect of the utmost luxuriance; the trees became arrayed in leaves, ﬂowers, and fruit; the springs gushed abundantly, and water-nymphs, light as a swan’s feathers upon the billows, danced down the foaming waterfalls. In another scene Olympus shone forth with all its classic beauty; the aerial background was ﬁlled with hovering genii. Juno came borne along in her chariot by peacocks, whose trains glistened with radiance. The signs of the zodiac moved in procession: the entire scene was a perfect kaleidoscope phantasmagoria. The splendour of a single act would have drawn crowded houses to witness even the poorest play, and it was lavished upon ﬁve acts of Shakespeare — it was too much! Yes! we even sailed with the Ares in the gliding boat, and saw heir thoughts embodied. The whole background moved by — landscape succeeded landscape — a complete moving panorama. The ﬁnal scene was undeniably the most effective. It represented an open sea, rippled by the wind. Prospero, who is quitting his island, stood in the stern of the vessel, which moved from the background towards the foot-lights. The sails swelled, and when the parting epilogue had been spoken the ship glided slowly behind the side-scenes, and Ariel appeared, ﬂoating over the surface of the water and wafting his parting farewell. All the light fell upon him, insomuch that he, isolated by the electric ray, shed a meteoric splendour over the scene; a beautiful rainbow beamed away from him over the watery mirror. The moon that had shone brightly faded in the sunny radiance, and the rainbow glory beaming from him in the moment of departure. The enchanted public forgave the long intervals between the acts, and the interminable duration of the piece; which lasted on the ﬁrst representation from 7 to 12.30. Everything had been done that scenery and mise en scene could effect; and yet, after seeing all we felt overwhelmed, weary, and empty. Shakespeare himself was sacriﬁced to the lust of the eye. Bold poetry became petriﬁed into prosaic illustration. The living word evaporated, and the nectarean food was forgotten in the golden dish in which it was served up. None of the actors appeared to me remarkable as dramatic artists, except the representation of Caliban. Ariel, which was performed by a lady, was a lovely ﬁgure; in naming these I have mentioned the only two of any importance. Kean declaimed in the style of a preacher, and his organ was not ﬁne. I should more enjoy a representation of Shakespeare’s in a wooden theatre than here, where the play was lost in the properties. Comments: Hans Christian Andersen (1805-1875) was a Danish author, best known for his fairy tales. He visited Charles Dickens at the latter’s home in Gad’s Hill, Kent over June-July 1857, greatly outstaying his welcome, to the annoyance of Dickens’s family. He visited London with Dickens on a number of occasions, though it is not absolutely certain that Dickens himself was present at this production of The Tempest at the Princess’s Theatre, London, 1 July 1857. Charles Kean was the son of the actor Edmund Kean, but inherited few of his father’s gifts as an actor. He was actor-manager at the Princess’s Theatre in London 1851-1859. Kean stressed painstaking, supposed historical accuracy in sets and costumes for his Shakespeare productions, combined with elaborate scenic effects (requiring over 140 stagehands). With scene changes between the acts, the entire production of The Tempest lasted for nearly five hours, despite substantial cuts to the text. Kean played Prospero, Kate Terry was Ariel, and John Ryder played Caliban.